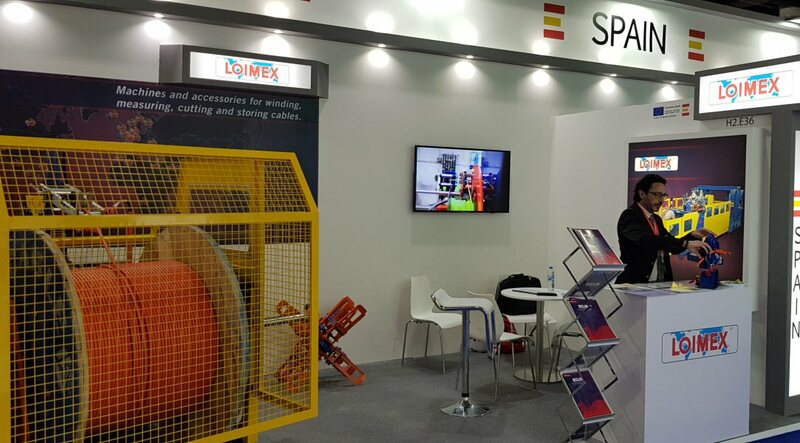 We have been this year at the MEE in DUBAI, the world's leading power event which we were showing our latest coiling machine, able to run at 200meters per minute with all the securities to be safe while the machine is coiling at fast speed. We have moved to the United States to install a new automatic line to make fiber optic rolls, guaranteeing the tension and thus avoid the damage of the optical fiber when colling it. We have completed the update of the 7 series with this latest 4 ton machine and for drums up to 2 meters in diameter. Completed all the renovations of our machines so that they are much safer and more efficient. Commissioning a Pay-Off DVR167 with pulley to automatically cut to length coils of cable, with the D18 coiler machine running at 200meters per minute, with automatic cutting unit and automatic cable feeding to the coiling device. One more edition LOIMEX is present at Matelec fair in Madrid. Thanks to all Loimex team for their support! Mobile platform, fully automatic, positions the cutting machine in the exact working position to the drum in the rack. Controlled by our software, it allows to minimize the movements in the warehouse with the maximum security through laser detectors and you have the stock control in real-time. New integration into a new cable processing line with pay-off type DVP6 and take-up type TRG250, with two label printing heads, check stick label and datamatrix code, all controlled by our SoftWinding software. Explain us your needs and we will look for a solution; adapting our cable cutting machines. First installation of two Japanese machines JAM brand for high cable production in Spain, the J-CPR-ZERO and the J-JN07SD. The machines comes with crimping on both ends and vision system for quality control.